How often do you think about your industrial wastewater tank. If you’re like most people, you don’t want to have to think about it, because thinking about it generally means you’re staring down a problem. Wastewater is inevitable in production, and caring for that wastewater is your responsibility under the law. Choosing the right tank today can mean the difference between dealing with the EPA and local regulators, or focusing on growing your business. The quality of a wastewater tank is essential. The most advanced and thorough treatment processes in the world mean nothing if you’ve got a tank that’s deteriorating or costing you an arm and a leg in ongoing maintenance. There are two philosophies when it comes to buying a tank. 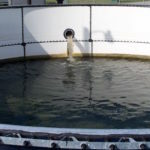 You can spend the money upfront on a high-quality tank with a long lifecycle that can handle the demands of your waste, or you spend less and pay for ongoing rehab and maintenance for the next several decades. That decision depends a lot on the way in which your company’s leadership feels about spending money, but if you’re going to make an investment in a tank soon, it’s worth it to explore glass Aquastore tanks. 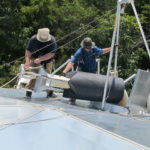 They are extremely durable even when continually exposed to chemical-heavy water, and they have a proven lifecycle of 20-30 years, vs. epoxy tanks that require rehab as early as eight years in. Remember, too, that unscheduled downtime on an offline, damaged or out-of-compliance wastewater tank will impact production. Every business wants to grow, and if your company is on the path towards expansion, your future development may be impacted by your ability to manage wastewater. Your discharge permits may be impacted by an increase in production or an expansion or change in product lines, and no CEO wants to hear that growth is being slowed by something like wastewater tanks. If you’re faced with rehabbing or replacing the tank you have today, consider the direction the business is going in. You want to be sure that your waste management processes are as agile as your production processes. Therefore, you want to be able to choose tanks that can be erected quickly and efficiently, and providers that understand the importance of compliance while meeting the needs of a fast-paced business. Space can be a determining factor in this process. 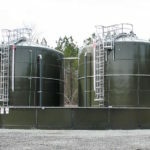 Most companies keep their wastewater tanks somewhere behind the facility, because no one really wants to think about them. That space can be restrictive when it comes to growing, replacing, or adding new tanks. There are ways to make limited space work, but you need to choose a partner who can work efficiently in small spaces. Keep in mind that glass tanks do not require the cranes, scaffolding and other heavy equipment that some other types of tanks require, and they can be an ideal solution when you need to expand but you don’t have much land to work with. 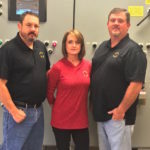 When you get down to brass tacks, you’re going to either spend a lot of money today on a high-quality, long-lasting glass tank or you’re going to spend a lot of money down the line worrying about maintenance and compliance standards on an epoxy tank. The truth is, only your organization can determine which approach is best. Given your unique financial situation, it can make sense to spend less today and worry about the rest later. There are pros and cons to each approach. The key to making the right decision is to gather enough information as you can from potential tank providers and weigh it against your budget and priorities. What About Water Used For Production? Most business leaders want to spend more time thinking about the water that makes them money, rather than their waste water. If you require tanks for the water you use to produce your goods, the same principles really hold true. Investing in a durable, high-quality tank with a long lifecycle upfront can save dollars down the line, and budgets might be more free here, since the water tank is an asset for production, rather than a cost center. 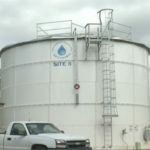 No matter what business you’re in it will ultimately be your priorities, the chemical makeup of the water, and the company’s financial situation that will really determine what type of industrial water and wastewater tanks to choose.